Mind Flex lets you move a ball with just the power of your mind (actually the tension of your face when you concentrate). A wireless headset monitors your brain activity. The more you concentrate, the higher the ball rises. 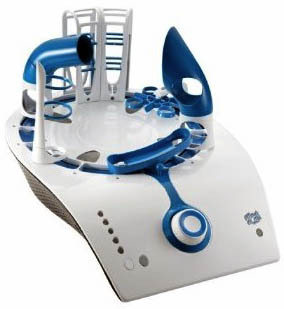 Mind flex is the obstacle course game you can customize in hundreds of combinations. Think it, move it, believe it. Can you conquer mind flex? A lightweight headset containing sensors for the forehead and earlobes measures your brainwave activity (really the making of contact with your skin). When you focus your concentration, a small foam ball will rise on a gentle stream of air. Relax your thoughts (and your face) and the ball will descend. By using a combination of physical and mental coordination, you must then guide the ball through a customizable obstacle course–the various obstacles can be repositioned into many different configurations. We wanted to see how people react to playing mind flex for the very first time: "Awesome. Mind blowing. This is the future of games, right here."